Marlon Samuels, the West Indies allrounder, has been ruled out of the New Zealand limited-overs series with the recurrence of a chronic wrist injury. The injury, on his right wrist, will require surgery. West Indies' physiotherapist CJ Clark confirmed that Samuels is returning home. "It will require surgery management and he returns home to seek that surgical opinion and advice from the WICB medical panel, headed by Dr Akshai Mansingh," Clark said. Coach Ottis Gibson said Samuels absence will be hard to cope with for an already-struggling team. "Marlon's injury is unfortunate at such a tough time for the team," Gibson said. "But it gives another player the opportunity to make a name for themselves in this series." West Indies are already without two of their biggest names, with Chris Gayle's hamstring and Kieron Pollard's knee keeping them out of the series. Dwayne Bravo, the ODI captain, said it would be difficult without the trio. "Chris Gayle, Samuels and Pollard are three of our better players, we can't hide that," Bravo said. "We're definitely going to miss them, because they are three world-class players and despite the talent we have, I don't think any of us can actually fit those shoes. For me as a captain, I'm going to miss their ability as well as their experience, but it's a good opportunity for other players, they get an opportunity now to make a name for themselves and try to stamp their authority. They're definitely going to be missed, but I'm not going to use it as an excuse if we don't play well. If we play to our true potential, we're going to do well." 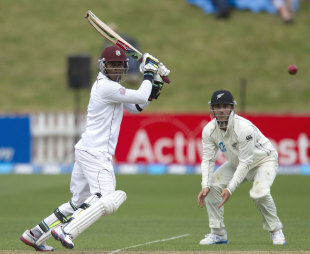 Wicketkeeper-batsman Chadwick Walton will remain in New Zealand following the Tests as Samuels' replacement. Walton has played two Tests and two ODIs, but is yet to score a run in one-day cricket. Gibson said he was confident, though, that Walton would make use of opportunities that came his way. "Chaddy has been on tour with us from the start, including the tour of India, without getting an opportunity. He has been working hard and growing as a player, and I feel confident that when his opportunity comes he will make the most of it." Samuels had been in patchy form in the three Tests, which West Indies lost 0-2, scoring one half-century but not touching 25 in the other five innings. His bowling action had been called into question during the series, and though he was cleared to bowl his part-time offspin by the ICC following biomechanical analysis, he was banned from bowling his quicker delivery - his elbow was found to flex beyond the permissible 15 degrees when he bowled that ball. West Indies play five ODIs against New Zealand, starting in Auckland on Boxing Day, followed by two Twenty20s.